The election of Ellen Johnson-Sirleaf for President in 2006 marked the start of a new era of hope. Affectionately dubbed the “Iron Lady”, Ma Ellen is the first ever democratically elected female head of state in Africa. A visionary leader, Harvard graduate, incorruptible, President Sirleaf earned widespread respect for her courageous opposition to previous undemocratic regimes (which even included a stay in jail). She is one of the most remarkable and effective leaders in the world today; and is up for reelection this October 2011. Since 2007, in response to a calling by Johnson-Sirleaf herself, a small group of students spend their summer in various ministries hoping to contribute to Liberia’s development. Rebuilding is no easy task. 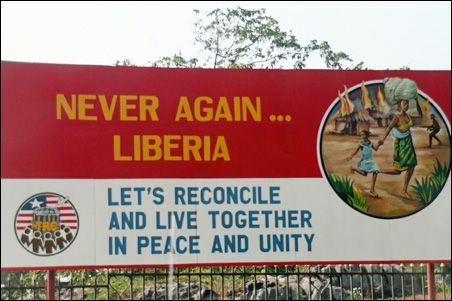 But if it keeps going on the same track, Liberia promises to become a fascinating case study for the way good governance and sound policies can deliver development in a post-conflict setting. Getting to witness a small part of it is an exciting prospect! Days to landing in Monrovia: 3! This entry was posted in Liberia and tagged Africa, Ellen Johnson-Sirleaf, Lebanon, Liberia, Monrovia, President of Liberia by Hala. Bookmark the permalink. You admire Ellen Sirleaf because she fighted for the independence and she’s still fighting for rebuilding her country..
this is a really interesting comparison Hala! I never thought of Lebanon as comparable to African nations which have also undergone civil war and reconstruction, but it totally makes sense. thanks for writing and I look forward to hearing more!